We are excited to announce our third book in the 365 Series was released on February 21, 2017. It’s called 365 Life Shifts: Pivotal Moments that Changed Everything! It is a collaborative book compiled by Jodi Chapman & Dan Teck.Jerri’s Featured Piece is called, “A Message of Hope Received.” It is a story about a visitation from her mother’s spirit. She asks Jerri to give a life altering message to her brother, Ed.Gretchen’s Featured Piece is called, “Visions of Fire and Feelings of Dread.” Have you ever wondered what it would be like to glimpse into your future? If you had a prophetic vision, would you make a different decision that would change your future’s trajectory? This story reveals how Gretchen’s intuition became her compass rose, like a trusted navigation system that would guide her through the disastrous experience of her husbands near-death, plane crash and survival.You can see the trailer here. 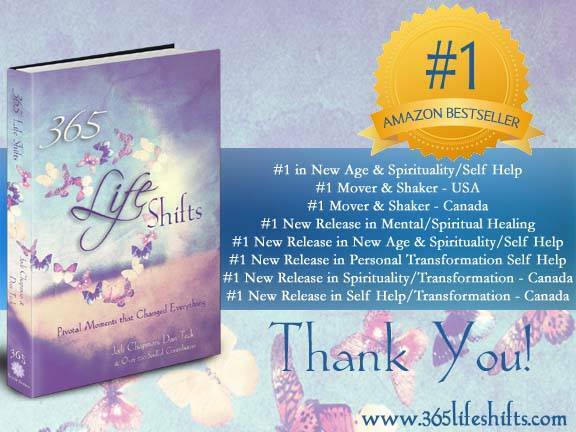 365 Life Shifts: Pivotal Moments that Changed Everything will contain 365 personal stories (from over 200 contributing authors) of such life-changing moments – experiences that inspired, uplifted, shook us to our core, got us back on track (or onto a new track altogether), and led us toward our true selves. It’s our hope that when someone picks up this book, they can flip to any page and find a true-life story that will provide insight, inspiration, and encouragement throughout their own life journey – offering a reawakened sense of awe and a renewed reverence for life itself.